" Guest Hosting 'Malloy Show' Thursday!	" 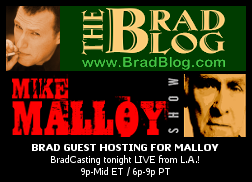 I'll be guest hosting the nationally syndicated Mike Malloy Show tonight (and again tomorrow), and again we'll be BradCasting LIVE from L.A.'s KTLK am1150 9pm-Midnight ET (6p-9p PT). Please join us by tuning in, chatting in, Tweeting in and calling in! VAN JONES, Former White House adviser on green jobs initiatives, award-winning environmentalist and human rights advocate and now American Progress Senior Fellow, on where those WH initiatives and Congressional climate and clean energy legislation now stand (or don't) in D.C.
LAIRD MONAHAN, who walked across the U.S. with his brother and fellow Vietnam vet Robin to spotlight concerns about the Supreme Court's horrific Citizens United ruling allowing unregulated (and undisclosed) corporate campaign dollars in U.S. elections. ALLEN ST. PIERRE, Executive Director of NORML, on California's Prop 19 which, if passed in November, would regulate and largely legalize the sale and possession of marijuana in the state. « PREVIOUS STORY "'Green News Report' - October 7, 2010"
"Guest Hosting 'Malloy Show' Thursday!" Wow- Did Laird say that the tea partiers were on board to mitigate Citizens United? Now WHY should Democrats, Liberals, Progressives and Independents care? Think about this for a minute… Lets say a nation was experiencing hard times, the average citizens desperate for decent jobs with reasonable wages and benefits. Couldn’t the faintest hope of such rewards be used as a recruiting tool? Honest to GOD, after Bush/Cheney I just can’t understand how ANY American could be so shameless, silly or stupid to vote Republicans back to power. What is about you degenerate morons that you put your trust in these wealthy, silver spoons who have NO IDEA what the average American struggles through? George H. W. Bush’s kid… Ron Paul’s kid in KY, Dan Quale’s kid in AZ, Satan O’Donnell’s kid on a blood stained alter… lol. Paid for HO’s like Ken Buck in CO, Pat Toomey in PA, Sharon Angle in NV, Joe Miller in AK and Ron Johnston in WI are leading in the rigged polls… COME ON? You people can’t possibly be that ignorant and misinformed, can you? I’m going to make sure this right-wing phenomenon goes down as one of the low points in US history. Down there with April 10, 1950 when the Supreme Court gave in to hysteria and washed it‘s hands… leaving rights and justice to H.U.A.C. THAT will be your future, Republicans/Conservatives of 2008-2012 will be hated and ridiculed for all times. NO EXCUSES! Oh yeah, the coward who couldn't stand on his own 2 feet in reguards to 9/11, and a simple petition that he signed. Thats Van Jones to a lot of peeople at this point. Positive is good, balls and conscience are better. I hope you find a way to probe Van Jones on his views on the 9/11 theory of conspiracy. And why Obama threw him under the bus. It's strange how quick Van Jones goes and how quick Rick Sanchez goes and Helen Thomas. But others who call for assassinations and out CIA agents seem to get a pass. What is the truth. Sometimes questioning the truth gets a quicker response than spewing lies or committing crimes. What happened to Helen Thomas, Van Jones, and Rick Sanchez is a shame. Go Brad!! Yikes. Link did not go. Here it is again. (TN) 10/10 - COVERUP IN SHELBY COUNTY - A ten-candidate lawsuit was dismissed today in Memphis. Most of the evidence was never presented at all, nor were any of the key witnesses called to testify in court, save one: Julie Anne Kempf, who delivered powerful testimony about failure to follow the most basic election safeguards. - A so-called "CPA report" created for the election commission, containing no names of any individuals or company, based on results that according to the Elections Commission's own expert were "nonexistent", cites the inability to reconcile 11 of the precincts examined. They only examined 10 percent of Shelby County's 236 precincts, which would be 23; extrapolating that, nearly half of all precincts examined could not be reconciled. This was not delved into at trial. Most voterless votes were found in large Republican precincts, a non-random distribution. The pictures above show the Shelby County Participating Voter list, with 10 absentee votes and 20 At Polls votes. Superimposed over this is a photo of Shelby County's certified results, which show 619 At Polls votes. so bev has documented 30 voters and 619 votes and the judge does not see a problem with that?...or did the attorney not show it in court? Election Commission attorney Sam Muldavin told Goldin there was a fundamental misunderstanding by the plaintiffs about how to read data from the voting machines. karenfromillinois (#8) ~ omg. Thank you so much for posting that. I hadn't heard. I wish I could say I was surprised, but this TN fiasco has closely mirrored the legal "misfirings" I witnessed first hand and documented obsessively in Sarasota 2006 when the very same model ES&S iVotronic machines lost 18,412 votes with hundreds of voters certain their vote didn't count. Karen, fyi, I've been kicking myself all week for not having brought that (ghastly ES&S) experience more directly to Bev's attention. She was asking for someone to videotape and I didn't mention that there was not going be any way they'd let a citizen into the court room with a camera. The many ways our attempts with VIDEO THE VOTE to get a camera in that courtroom were denied became comical. And now...this one dismissed *and barely reported.